Here at Georgetown, we get to experience the surrounding neighborhood as well as the city of Washington, D.C. But do you ever feel like life here is too fast-paced? Do you ever feel like you could take a few days to treat yourself, eat a waffle and hang out with your local government officials? Maybe you should pop by a little town called Pawnee, Indiana, the setting to NBC’s Parks and Recreation. 1. He knows how to prioritize. Georgetown students are notorious for balancing their many activities. Whether you’re planning on spending the night going to a club meeting, exercising at Yates or maybe even (gasp!) doing homework, you’ve got a full plate, but you’ll always find some way to get it done. Ron Swanson feels the same way. 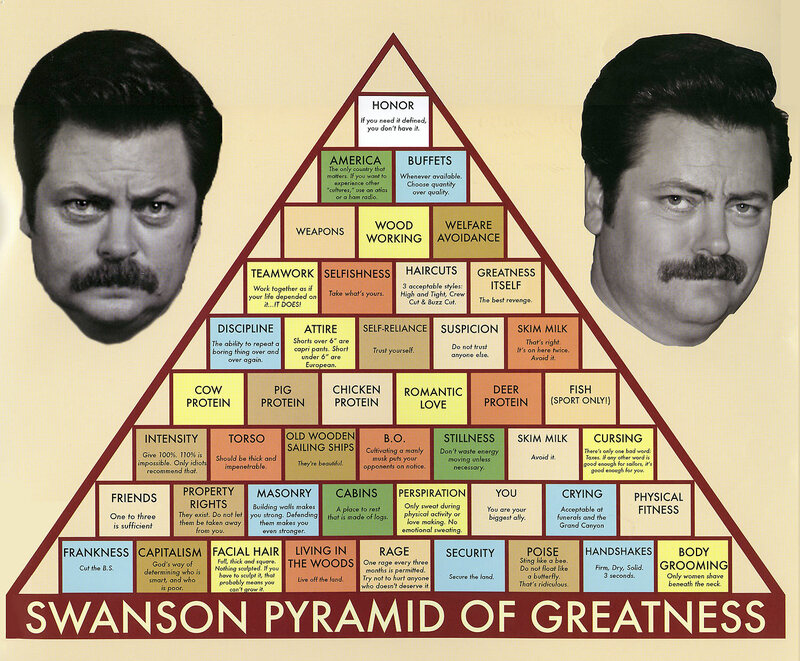 He’s got his own pyramid of greatness! 2. He has goals to work toward. We here at Georgetown are pretty ambitious. Whether you’re hoping to be the next President, the next Bill Gates or the BP champion of your floor, you have goals and dreams. Ron Swanson does too. Whether he’s passionately pursuing woodworking or bacon-eating, he strives to be the very best. This is the phenomenon where you look like you’re working really hard but in fact you’re surfing 4E or Facebook. As an employee of the government who hates the government, this basically summarizes Ron’s life. For Georgetown examples of fake-working, sneak up behind 99% of students on Lau 2 on any given night. 4. Yeah, he’s a little bit jaded. At this point in the year, it’s safe to say that most students have comfortably settled into their Georgetown lives. Gone are the days of not being sure which Corp drink to order (any of these will do), gone is that tiny sense of shame when you sit down in Lau on a weekend night (midterm season: never forget), gone are the days of getting lost in the MSB (actually, this still happens). Ron has been jaded since birth and he doesn’t care who knows it. 5. He may be serious sometimes, but he knows how to party. Do I even have to explain?